One for the footnotes: Timothy Taylor has tracked down the origin of the "pushing on a string" metaphor for expansionary monetary policy in a depressed economy. It looks like we owe it to Maryland congressman Thomas Alan Goldsborough, who used it in a 1935 hearing with Fed Chairman Marriner Eccles. The BEA released the advance estimate of second quarter GDP growth today: the good news is that US output grew at a 2.3% annual rate in the period - a healthy, though unspectacular, pace. 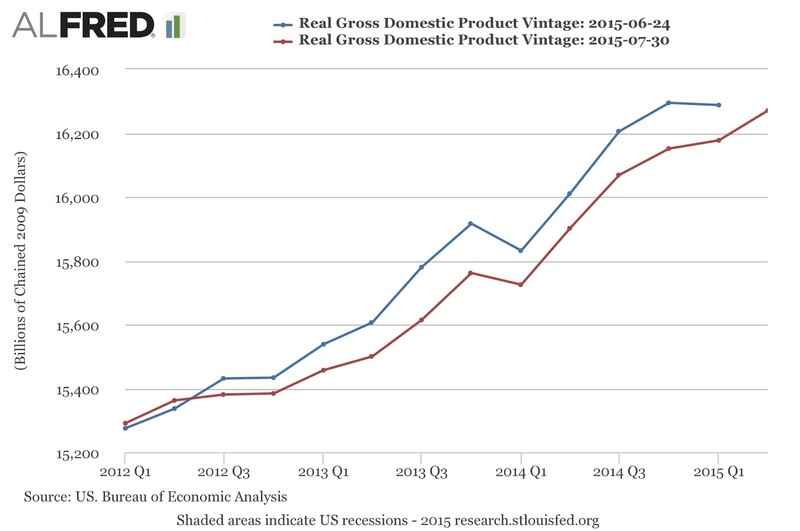 The growth was largely driven by consumption (about 70% of GDP), which grew at a 2.9% rate. Also, the BEA revised up its estimate of growth in first quarter to an 0.6% rate, from -0.2% in the previous release. The more disappointing news came in the "annual revision" of estimates for 2012-2014 which were included in today's release. The new estimates indicate that the agonizingly slow recovery has been a little more sluggish than we previously thought - GDP growth was revised downwards 0.1pt for 2012 and 0.7pt for 2013. The red line shows the revised figures, the blue line is the previous estimate. The lower estimates of output growth also imply that labor productivity - output per unit of labor - growth was a little slower than previously thought. Since labor productivity is the main determinant of changes in living standards over time, further evidence that it has shifted to a lower trend is a discouraging indication about long-run prospects. This release also had an interesting wrinkle: the BEA is also now releasing the average of the standard expenditure-based GDP figure and the income-based measure (which it calls Gross Domestic Income). In principle, they should be the same, but, in practice, there is usually a "statistical discrepancy." 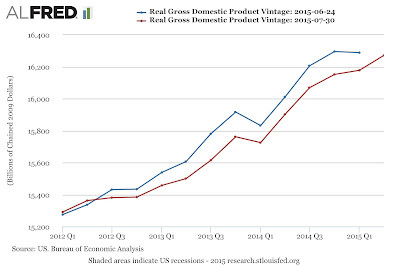 This issue brief from the Council of Economic Advisors explains why the average - which its calling "Gross Domestic Output" (we'll see if that sticks...) might be a better indicator. An archive of British Movietone newsreels has been added to YouTube, including one of John Maynard Keynes commenting on Britain's departure from the gold standard in 1931: Another newsreel discusses leaving the gold standard and includes footage of Sir Josiah Stamp explaining the decision: This Telegraph article describes some of the correspondence between the bank and the government about the crisis. Britain's exit - after painfully resuming the gold standard at its prewar parity in 1925 - was one episode in a series of sterling crises in the 20th century. Last year, I posted some newsreels from the 1949 and 1967 devaluations. Note: An earlier post from 2011 had a fragment of the same Keynes newsreel, but now we are fortunate to have it in full. It looks as though Greece is staying in the euro, after all (for now at least...). The terms of the deal - pending approval by the Greek parliament - are not very favorable to Greece. Essentially it means more of the same - additional financing from the EU in exchange for more austerity, "structural reforms" (in some cases absurdly detailed) and a EU supervised privatization of state-owned assets. There is a vague promise to consider debt restructuring, but nothing concrete. The reports from the negotiations over the weekend reinforced the impression that Germany, along with some of the other smaller countries, really wanted to push Greece out, but the French and Italians worked to prevent this outcome. From the viewpoint of Germany, the issue is making sure that euro membership entails following associated rules and obligations: a more forgiving treatment of Greece would create a "moral hazard" problem, inviting more deviations in the future. However, the rules they are enforcing do not make economic sense: they force procyclical fiscal policies and fail to confront an unsustainable debt burden. (Some sympathy for the Germans, though: as this VoxEU piece by Kang and Mody illustrates, they were reluctant about the euro from the beginning). The response to the deal has been highly critical: see Barry Eichengreen, Martin Sandbu, Wolfgang Munchau, Christian Odendahl and John Springford, Paul Krugman, Ambrose Evans-Pritchard, John Cassidy, Eric Beinhocker, Neil Irwin. This interview with former finance minister Varoufakis is also interesting. Simon Wren-Lewis has a nice post on "trust," a word which has been thrown around alot lately. The FT's Gideon Rachman has a somewhat different take, emphasizing that Germany backed off its evident desire to force a "Grexit". One condition of the deal was continued IMF involvement. While Greece objected to this, it may ultimately prove to be in their favor - the IMF has the capacity to act as a voice of sanity, and they have said that Greece's debt is unsustainable (much of the criticism of the IMF is that they haven't pushed strongly enough for a debt writedown, as they ordinarily would). IMF chief economist Olivier Blanchard discussed Greece in a blog post (and Ashoka Mody offered a critical response). Although some of us think Greece might be better off outside the euro, their willingness to sign on to an agreement of the sort the Syriza govermnment came in to power promising to end (and essentially what they voted "no" on in the referendum a week ago) demonstrates how badly they want to stay in. As long as Greece is saddled with an unsustainable debt, the prospect of a rerun of this drama will remain. But the removal of the immediate threat of a euro exit hopefully will give a short-run boost (Daniel Davies gives some reasons for short-term optimism). As for the euro, the last several years have laid bare the institutional shortcomings - some of which are discussed in this Simon Tilford column - underscoring the reasons many economists were skeptical of the project from the outset. Although political solidarity and continued moves towards integration might have overcome these flaws, the last several weeks have demonstrated that, as a political matter, the sense of commonality needed to make the euro work does not exist. Europe's Final Countdown to "Grexit"? The "no" vote in its referendum last Sunday seems to have accelerated the momentum towards a Greek exit for the euro. While there is plenty of room to second-guess the negotiating strategy, I think the Syriza government and Greek voters were right to reject continuing on the same policy path. If they are forced out of the euro (which looks likely), it will be traumatic and disruptive, but the experience of Argentina in 2002 suggests a fairly quick rebound (from a very low starting point) is possible. Ultimately, this may be worse for the rest of Europe - not only does it open up the possibility of future crises by demonstrating the reversibility of the euro, it also demonstrates a fundamental lack of solidarity: the "ever closer union" isn't really that close (see Dani Rodrik and Peter Eavis). Some of Europe's leaders seem recognize this; the main stumbling block in the last-ditch negotiations appears to be on whether some of Greece's debts will be written off (i.e., "restructuring" or "haircut"). The IMF has publicly said that Greece's debt are not sustainable (debt writedowns are part of standard IMF interventions), and the US is urging a writedown. Politically, it is easy to see why this is a nonstarter in many of the creditor countries. Some "leadership" is badly needed, particularly in Germany, and doesn't appear to be forthcoming: in the Times, Bruce Ackerman calls out Germany's "failure of vision." Clive Crook argues that the Greeks are being deliberately pushed out. Eduardo Porter notes that Germany seems to be forgetting that it has been a beneficiary of debt relief (see also Thomas Piketty). The German stubbornness may be more than just politics - Simon Wren-Lewis argues part of the problem is that they (naturally) do not want to acknowledge the failure of their economic ideology. Last minute negotiations are ongoing... when Syriza first came to power, the idea of GDP-linked debt was raised. This seems to have fallen off the table, but it might provide a "face saving" way out: the IMF's knack for optimistic projections could be helpful in making the value to the creditors appear initially large. Since they would have some equity-like characteristics, replacing the debt with GDP-linked bonds would have some passing similarity to what normally occurs in a corporate bankruptcy, where creditors receive equity stakes (and perhaps this would help make a "fairness" argument). And it actually might work: if the chances of future austerity and/or a euro exit were substantially reduced, Greece should have a chance at some rapid "bounce back" growth. I don't know anything about Greek politics, but I would think that, in the long-run, a government led by an "outsider" party like Syriza might have a better shot at implementing structural reforms like better tax collection. See also: a good "tick-toc" on the negotiations from the Times' Landon Thomas on the breakdown of negotiations last week; Ambrose Evans-Pritchard; Ashoka Mody is very harsh on the creditors and the IMF, Daniel Gros is a bit more sympathetic.